Recent advances in both experimental techniques and theoretical methodologies have meant that increasingly sophisticated studies concerning the formation, structures, energetics and reaction dynamics of state- or energy-selected molecular ions can now be performed. In order to better serve the ion chemistry and physics community, each volume of this series is dedicated to reviewing a specific topic, emphasizing new experimental and theoretical developments in the study of ions. The Wiley Series in Ion Chemistry and Physics will help stimulate new research directions and point to future opportunities in the field of ion chemistry and physics. This volume, the sixth in the series, concentrates on the area of large ions. The production, detection and analysis of large ions are areas which have taken on great importance in recent years, in particular in the biomedical and biochemical fields. The understanding of large ions presents unique and formidable challenges which are very different from those associated with the study of small ions. This volume focuses on some of the fundamental chemistry and physics associated with the behavior of large ions, with the contributors addressing the issues in a quantitative fashion, in order to elucidate clearly some of the key recent advances which have taken place. As such, Large Ions: Their Vaporization, Detection and Structural Analysis provides an excellent snapshot of current research in this fascinating and important area. The six chapters are written by some of the leading experts in the field, and together they will be of great interest to experts and newcomers, both of whom will benefit from the in-depth discussion of the latest methods and results. 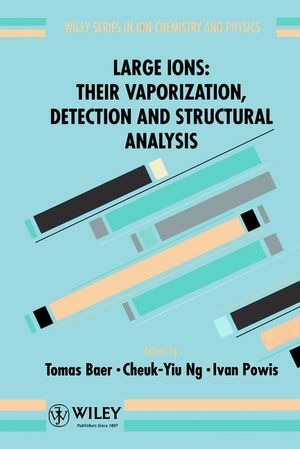 Tomas Baer is the editor of Large Ions: Their Vaporization, Detection and Structural Analysis, published by Wiley. Cheuk-Yiu Ng is the editor of Large Ions: Their Vaporization, Detection and Structural Analysis, published by Wiley. Investigation of Large Ions by Fourier Transform Mass Spectrometry(F. Hadjarab & C. Wilkins). Steps Towards a More Refined Picture of the Matrix Function in UVMALDI (M. Karas, et al.). Models for Matrix-Assisted Laser Desorption and Ionization: MALDI(R. Johnson). Laser Ejection of Oligonucleotides (R. Levis). Collisional Activation Studies of Large Molecules (E. Marzluff& J. Beauchamp). Surface-Induced Dissociation of Large Ions (V. Wysocki & A.Dongre).